This Auction contains, Wholesale Pallets of Hand/Power Tools, Compressors And Household Lighting! Also Features Nice Doors, Decking Materials, Tool Boxes, Scaffolding, Appliances and More! At MN Home Outlet, our mission is to help you improve your home without demo’ing your wallet. That’s just a catchy way of saying that we love helping people save money. We partner with major retailers and liquidation distributors to offer a wide range of inventory, from home improvement to home goods (and more!). We offer new, “like new” and used items and everything is below retail price. Our inventory is updated daily and we’re constantly restocking our eBay "shelves" with new deals. Thanks for stopping by and we look forward to helping you improve your home! Husky 61 in. W x 18 in. D 18-Drawer Tool Chest and Cabinet Combo in Black, H61CHTR12 - Dented. Husky 61 in. W x 18 in. D 18-Drawer Tool Chest and Cabinet Combo in Black, H61CHTR12 - Dented. There is a Dent on top chest LH Side and one of the top drawers of the main box has been dented (Unit still locks). he top chest has 6-drawers and a tall top till that is supported by gas struts. On the left-hand side is an integrated power strip with 4 outlets and 2 USB ports, which allows you to charge your tools and electronic accessories even while the unit is locked. The bottom cabinet has 12-drawers including 1 that runs the full-width of the unit. MetalTech Safeclimb Baker Style 6 ft. x 6 ft. x 2-1/2 ft. Scaffold 1100 lbs. Capacity, I-CISCH1. In nice condition. Also includes 2 additional Sides, Deck and 1 additional side Brace. Constructed with rugged 1-1/2 in. 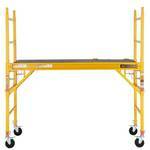 square steel tubes with a baked-on yellow poly powder coat finish with ANTI-SLIP Safeclimb ladder rungs. The unit has a load capacity of 1100 lbs. spread evenly across the deck. 5 in. casters. Deck with climb through opening for safe climbing. MetalTech 4 ft. x 4 ft. x 2 ft. Mini Rolling Scaffold 500 lb. Load Capacity with Tool Shelf, I-IMCNAT. Missing decks and 1 caster. When not in use, it folds down to only 3 in. in depth, making it easy and convenient to store. MetalTech Job Site Series 5 ft. x 4 ft. x 2-1/2 ft. Scaffold 900 lbs. Load Capacity, I-IMIS. Missing Top Safety Bar. Includes 4 Double locking casters, two decks and folding tool shelf. Can easily fit between standard door openings, reducing setup time when transporting from room to room. MetalTech Job Site Series 5 ft. x 4 ft. x 2-1/2 ft. Scaffold 900 lbs. Load Capacity, I-IMIS. USED/Missing Top Safety Bar, Decks and 2 Double locking casters. Includes Frame and folding tool shelf. Can easily fit between standard door openings, reducing setup time when transporting from room to room. Jeld-Wen 52 in. x 80 in. 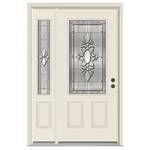 3/4 Lite Langford Primed Steel Prehung Left-Hand Inswing Front Door with Left-Hand Sidelite, H30934. In nice condition, Some minor scratches and trim needs to be tightened. Reinforced lock area provides strength and security. Predrilled double bore hole. 4 9/16" jamb. 2-Coats of neutral, low-sheen, baked-on enamel primer enables easier finishing. Steel Security Door In Burgundy - Scratch and Dent. Steel Security Door In Burgundy - Scratch and Dent.. Door Measures 34" X 74 1/2" Tall. Dent on decorative Window guard and several scratches on door. (see photos). Otherwise door is in nice condition. RH Outswing. 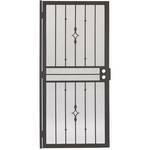 Gatehouse Covington Bronze Steel Surface Mount Single Security Door (Common: 32-in x 81-in) 91836821. In nice condition. The door offers added protection while letting in fresh air with a durable expanded metal screen. Reinforced lock box built into frame accepts standard double cylinder deadbolt and keyed hardware sets. Tamper-resistant pre-hung hinges offer added strength and durability. Pella Silding Glass Door with Screen Issues and Missing Top Roller Glides In White. Screen is stuck in-between glass. Otherwise door is in nice condition and if properly fixed would be a nice replacement. Door measures approximately 36 1/2" X 77" Tall. 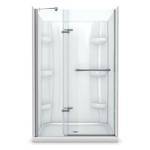 Bosco DreamLine Frameless Sliding Door For Tub Or Shower with Chrome/Silver Finish. Bosco DreamLine Frameless Sliding Door For Tub Or Shower with Chrome/Silver Finish. Never installed, opened box for photo. Glass panels measure 22" X 67" Tall. Hardware, track system and instructions are included. Thick and Heavy Wooden Counter Top or Work Area in Gray With 18" X 8" Cut Hole. Thick and Heavy Wooden Counter Top or Work Area in Gray With 18" X 8" Cut Hole. Piece is in nice condition. MAAX Reveal 32 in. x 48 in. x 76.5 in. Center Drain Alcove Shower Kit in White, 105963-000-001-100. In nice condition, Missing hardware and door, Only includes walls and base. Shower wall features easy front installation with snap clips, convenient foot rest and storage shelves for your bathroom essentials. WHOLESALE/SALVAGE PALLET OF RETURNS - 14 CHAINSAWS. This wholesale pallet consists of brand names such as ECHO, REMINGTON, RYOBI and MORE! These are retail returns from big box home improvement stores. These items could be missing parts, need Minor or Major repair, or just Gas and Oil. These units are sold as-is for parts or restore and are intended for those who are familiar with small engine repair and outdoor power equipment. Please inspect before bidding. WHOLESALE PALLET OF RETURNS - MIXED LIGHTING AND BATHROOM EXHAUST FANS. WHOLESALE PALLET OF RETURNS - MIXED LIGHTING AND BATHROOM EXHAUST FANS. This wholesale pallet consists of brand names such as NuTone, allen + roth, Portfolio and MORE! These are retail returns from big box home improvement stores. These items could be missing parts, need Minor or Major repair, or just scratched and dented. These units are sold as-is for parts or restore and are intended for those who are familiar with electronic repair. Please inspect before bidding. WHOLESALE PALLET OF RETURNS - CEILING FANS. This wholesale pallet consists of brand names such as Hampton Bay, Harbor Breeze, Hunter and MORE! These are retail returns from big box home improvement stores. These items could be missing parts/broken globes, need Minor or Major repair, or just scratched and dented. These units are sold as-is for parts or restore and are intended for those who are familiar with small motor/electronic repair. Please inspect before bidding. Steves & Sons 60 in. x 80 in. 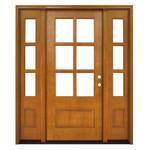 Craftsman Savannah 6 Lite LHIS Autumn Wheat Mahogany Wood Prehung Front Door with Double 10 in. Sidelites. M6410-103010-AW-4ILH. Door is in very nice condition. Sells for $2,150.00 Retail. Door has double 2-3/8 in. bore for easy lockset and deadbolt installation. Requires rough opening of 62-1/4 in. x 82 in. actual unit size 4-9/16 in. x 61-3/4 in. x 81-1/2 in. Unit is constructed of 36 in. door and two 10 in. sidelites. Streamline Freestanding 60 in. 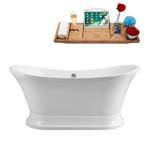 Acrylic Flatbottom Non-Whirlpool Bathtub in Glossy White with overflow, N200CH. New in Box. Opened for inspection and photo. Tub is in nice condition. Comes with Gold color external drain and bathtub tray (accessories on tray photo are not included). Tub can hold up to 55 Gal. of water. OVE Florence 60" X 22" X 34.5" Tall Vanity in Black with Marble Vanity Top in White with White Basin and Gold Accents. In very nice condition. Very small chip on vanity RH very back corner, tiny scratches (see Photos) Drawers on RH side may need to be adjusted as they need some help closing all the way. Vanity top pre-drilled for a standard 3-hole, 8 in. widespread faucet. Lots of storage space- six drawers and two doors with adjustable interior shelf. Includes backsplash. Genuine Italian Carrera marble top. Sells for $1,500.00 Retail. 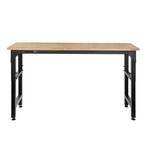 Husky Heavy Duty 6 ft. Workbench HTC1000004 Measures 72 in. W x 24 in. D x 41 in. H (Adjustable height ranges from 35 in. to 42 in. tall). New in box. the legs fold flat for storage when not in use. This workbench also features an integrated power strip and can support up to 2,300 lbs. Work from a seated or standing position. Adjustable feet. Magic Chef 9.9 cu. 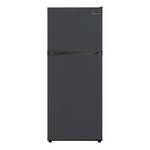 ft. Top Freezer Refrigerator in Black, HVDR104B. New in Box. Suitable appliance for smaller kitchens, breakrooms, office kitchenettes or anywhere with space constraints. 2.6 cu. ft. of freezer space and 7.3 cu. ft. of fridge space. 2 reversible doors. 2 Glass adjustable shelves and 1 wire slide-out wire shelf in freezer. Clear produce crisper and fresh food drawers. Interior incandescent light. Adjustable analog temperature control system. 2 Master Flow 1450 CFM Power Gable Mount Attic Fans EGV5. Never installed. Galvanized steel construction for durability. Mounts in the gable inside the attic. Helps to reduce energy costs and helps prolong life of the roof and shingles. For attics up to 2,300 Sq. 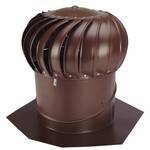 Ft.
3 Master Flow 1450 CFM Power Gable Mount Attic Fans EGV5. Never installed. Galvanized steel construction for durability. Mounts in the gable inside the attic. Helps to reduce energy costs and helps prolong life of the roof and shingles. For attics up to 2,300 Sq. Ft.
2 Master Flow 1600 CFM Power Gable Mount Attic Fans EGV6. Never installed. Galvanized steel construction for durability. Mounts in the gable inside the attic. Helps to reduce energy costs and helps prolong life of the roof and shingles. For attics up to 3,000 Sq. Ft.
3 Master Flow 1600 CFM Power Gable Mount Attic Fans EGV6. Never installed. Galvanized steel construction for durability. Mounts in the gable inside the attic. Helps to reduce energy costs and helps prolong life of the roof and shingles. For attics up to 3,000 Sq. Ft.
Master Flow 1450 CFM Smart Power Gable Mount Attic Fan. EGV5SMT. perfect for attics up to 2,300 sq. ft. Includes adjustable thermostat & humidistat. Connects directly to many Wi-Fi or Bluetooth® technology-enabled devices. Mounting brackets included for installation. Helps remove damaging heat and moisture from the attic. Master Flow 9 in. x 9 in. 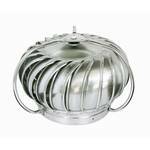 Stainless Steel Fixed Chimney Cap, CC99SS. Fits flue tile range (7-1/2 in. x 7-1/2 in. to 9-1/2 in. x 9-1/2 in.). caps provide protection against dangerous sparks while reducing downdrafts, clogging, soot, and creosote build-up. Single-piece hood for less chance of leaks. Master Flow 9 in. x 13 in. Galvanized Steel Fixed Chimney Cap in Black, CC913. Fits flue tile range (7-1/2 in. x 11-1/2 in. to 9-1/2 in. x 13-1/2 in.). Single-piece hood for less chance of leaks. Provide protection against dangerous sparks while reducing downdrafts, clogging, soot, and creosote build-up. 8 in. x 8 in. Galvanized Steel Adjustable Chimney Cap in Black, SCCA. Fits a variety of sizes 8 in. x 8 in. through 13 in. x 13 in. and 8 in. O.D. round through 12 in. O.D. round. Single-piece hood for less chance of leaks. Provide protection against dangerous sparks while reducing downdrafts, clogging, soot, and creosote build-up. Master Flow 9 in. x 9 in. Galvanized Steel Fixed Chimney Cap in Black, CC99. Master Flow 9 in. x 9 in. Galvanized Steel Fixed Chimney Cap in Black, CC99. Fits 7 1/2" X 7 1/2" - 9 1/2" X 9 1/2". Single-piece hood for less chance of leaks. Provide protection against dangerous sparks while reducing downdrafts, clogging, soot, and creosote build-up. Master Flow 12 in. 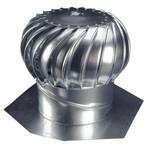 Weatherwood Galvanized Internally Braced Dual-Bearing Wind Turbine, GIC12WW. The adjustable base allows for installation on virtually any roof; from 2:12 pitch up to 12:12 pitch. Dual-bearing system with encased design helps to prevent dirt, dust, sand, and other foreign materials from damaging the bearing, resulting in a smoother spin. Master Flow 12 in. Galvanized Internally Braced Dual-Bearing Wind Turbine in Black, GIC12BL. The adjustable base allows for installation on virtually any roof; from 2:12 pitch up to 12:12 pitch. Dual-bearing system with encased design helps to prevent dirt, dust, sand, and other foreign materials from damaging the bearing, resulting in a smoother spin. 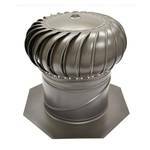 Master Flow Weatherwood 12-in Galvanized Steel Externally Braced Roof Turbine Vent GC12EWW. The adjustable base allows for installation on virtually any roof; from 2:12 pitch up to 12:12 pitch. Dual-bearing system with encased design helps to prevent dirt, dust, sand, and other foreign materials from damaging the bearing, resulting in a smoother spin. 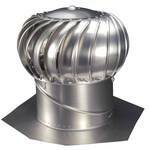 Turbine will vent approximately 500-sq ft of attic space and requires a minimum of 91-sq in of attic intake Net Free Area. Master Flow 12 in. Galvanized Externally Braced Replacement Turbine Head. GT12E. Dual-bearing system with encased design helps to prevent dirt, dust, sand, and other foreign materials from damaging the bearing, resulting in a smoother spin. Fits most other 12 in. turbine brands. Whirlybird 12 in. Mill Finish Aluminum Internally Braced Wind Turbine, BIB12. An exclusive vari-pitch base adjusts to a 12/12 roof pitch for use on many roof applications. Extends the life of shingles, insulation and other building components by exhausting damaging heat and moisture from attic space. Whirlybird 14 in. Brown Aluminum Internally Braced Wind Turbine, BIB14BR. An exclusive vari-pitch base adjusts to a 12/12 roof pitch for use on many roof applications. Extends the life of shingles, insulation and other building components by exhausting damaging heat and moisture from attic space. Masterbuilt MPS 230S Propane Smoker, MB25050217 - Shelves are Slanted. Masterbuilt MPS 230S Propane Smoker, MB25050217 - Shelves are slanted (appears holes were not properly drilled or wall was installed incorrectly) Never Used, In nice condition. Features: Four chrome-coated smoking racks. Built-in temperature gauge. 15,400 BTU stainless-steel burner. Cool touch wire handles. Porcelain-coated wood chip tray. Removable porcelain-coated water bowl – add moisture and flavor.